T. M. Nicholas was born in Rockport, Massachusetts in 1963 and is the son of Tom Nicholas, NA, AWS. He has studied privately with his father and also at John Terelak's Gloucester Academy of Art and the Montserrat School of Art, as well as workshops with noted California artists, Jade Fon, Morris Shubin, Millard Sheets and George Gibson. He has received 97 awards from 1981 to the present, including several Gold and Silver medals. T. M. Nicholas T. M. Nicholas was born in Rockport, Massachusetts in 1963 and is the son of Tom Nicholas, NA, AWS. 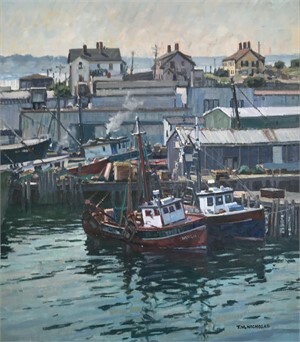 He has studied privately with his father and also at John Terelak's Gloucester Academy of Art and the Montserrat School of Art, as well as workshops with noted California artists, Jade Fon, Morris Shubin, Millard Sheets and George Gibson. He has received 97 awards from 1981 to the present, including several Gold and Silver medals.